The latest set of data out of the United States increases the confusion factor associated with future monetary policy and inflation trends. Although I am a recovering secular bond bull, it seems that the bond market remains somewhat complacent about Federal Reserve policy (with my usual disclaimer about a near-term recession). Historically, central banks followed the economy with a lag, and I would not expect things to be radically different this time. This article discusses a few topics that have struck my interest in recent days. Unfortunately, discussions of theory are back. I am starting to pursue a collaboration with Alexander Douglas (an academic philosopher), as we wish to write an article about Dynamic Stochastic General Equilibrium (DSGE) models from a philosophy of science perspective. As a result, I feel somewhat like I am trapped in a parody of The Godfather, Part III, being pulled back in to discuss DSGE macro. Although I want to otherwise avoid being bogged down in theory, the belief that we can discuss the empirical data without reference to theory in this case is just wishful thinking. I will start with a discussion of the data, which would presumably be an empirical discussion. 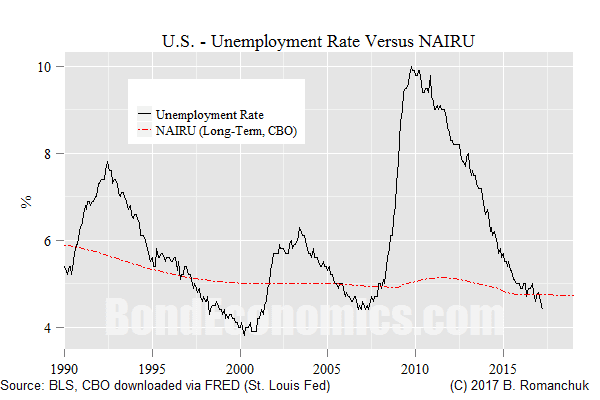 The NAIRU concept has been the subject of a lot of empirical study, and the purported conclusions is that a falling unemployment rate is associated with rising inflation. Of course, the response of the data to that empirical work is to ignore it: inflation is falling. Core CPI has dipped below 2%, and average hourly earnings is mired at a level that matches the lows of the "jobless recovery" of the early 1990s. This divergence has been the subject of much reflection, and needless to say, there is a bias in favour of the theoretical concept of NAIRU versus observed inflation data among many economists. 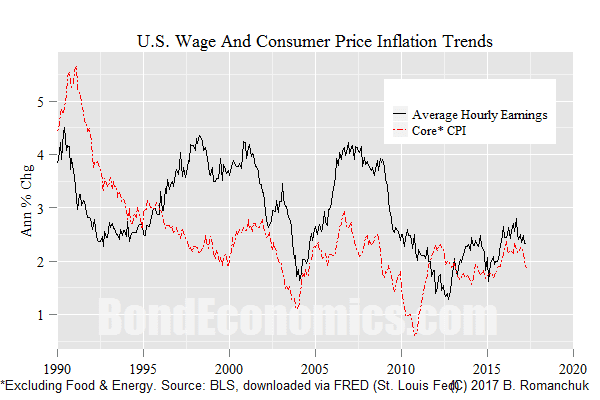 There is a great deal of analysis that rips apart the various employment and inflation data to prove various points. As a result, I find it completely unsurprising that there has been no relationship between the unemployment gap (difference between the unemployment rate and NAIRU) and inflation. Unless something big changes, there is little reason to believe that inflation is going to move significantly in one direction or another. That said, I believe that the Federal Reserve would like to get the policy rate away from the zero bound. Unless something goes seriously wrong, a subdued pace of rate hikes (plus a gradual run down of securities holdings) seems to be their preferred course of action. If inflation does not move (as I suspect), they will take credit for "stabilising inflation expectations" and declare victory for New Keynesian economics. Over the past few decades, mainstream economists assured everyone that monetary policy alone could stabilise the cycle, and a fairly impressive amount of resources was dumped on monetary economic research. So one would think there would be an adequate theory to allow them to determine how to set the interest rate in response to developments in the labour market and inflation. They had one job, and that was it. Admittedly, they were somehow surprised by the zero lower bound of interest rates. (Apparently one of the side effects of not actually solving the equations in your mathematical models is that you have no idea how to predict their behaviour. Who knew?) Nevertheless, a complete inability to judge the level of slack in the economy is not exactly awe-inspiring. Although this looks bad, the situation is more difficult than it might appear. I have been reading commentary by non-economists that argue that economists should be more empirically minded. "Use data to choose models." was one insight that I saw offered. This is almost as useful as saying that economists "should be more scientific." Believe it or not, economists actually thought of this -- decades ago. The problem is not that the data does not fit the models, rather it is fitting too many models. I have not formalised my model, but arguing that inflation is stuck near 2% for institutional reasons does fit the post-1992 data well. At the same time, various mainstream models are able to generate output consistent with observed data. As I discussed in Interest Rate Cycles: An Introduction, mainstream economics relies on variables whose values are determined by statistical inference (the output gap, NAIRU, the natural rate of interest). So long as economic time series are relatively low frequency, those imputed values will shift in such a way so that the model output will track observed data. The mere existence of such imputed values is not too troubling. Other than some seriously wrong theories (the Quantity Theory of Money) or esoteric curiosities (the Fiscal Theory of the Price Level), most economic theories suggest that "labour market overheating" is related to inflation. In practical terms, that implies that something like an output gap exists (I call it a "generalised output gap" to distinguish it from specific estimates). The problem is that there is no theoretical construct to pin down its value. This ties into the justification for DSGE macro. In the Old Keynesian models, model equations were based on observed data. This would appear to satisfy naive calls for empiricism. Unfortunately, that data is dependent upon the policy frameworks that were in place. What happens if policy shifts? The promise of DSGE macro was that the models would be dependent upon "deep structural parameters," and it would be possible to predict what happens if policy changes. From my perspective, this premise is entirely reasonable. If all the data we have for a system includes the effect of a feedback loop (the policy rule), we need to incorporate the possibility of the feedback rule changing in our model estimates. However, this could have been addressed without having to incorporate some of the more dubious features of DSGE models. The entertaining part of the previous observation is that it is one of the main complaints by post-Keynesians about the NAIRU concept (although they certainly do not use the same language!). The mainstream backers of the NAIRU are estimating it, using the current institutional framework as given. If we change the policy framework for employment, NAIRU estimates based on the old framework are entirely useless. After that long-winded digression, I can now return to some of the debates about the unemployment rate and overheating. (Such as the effect of an infrastructure investment surge.) The key thing to keep in mind is that the U.S. labour market is obviously fragmented, with some regions featuring wide spread underemployment, and others featuring tight labour markets. Any policy that increases demand in the areas with tight labour markets would be much more inflationary than one that is aimed at the areas of underemployment. In my view, the risk to my rosy inflation outlook is the possibility of sectoral overheating. For example, a tax cut aimed at the well-off could easily boost inflation in the sectors that cater to their needs. I doubt that this would be enough to drive the overall inflation rate beyond 3%, but that would be enough to cause panic amongst Fed hawks. In any event, the overall unemployment rate may not matter; it is the interplay of labour market slack between various sectors. Low Unemployment and the "Curve"
I want to finish off with a link to Gerard MacDonell's article "Low Unemployment and 'the Curve'." He discusses many of the issues covered here. I just wanted to highlight his comments about the Taylor Rule. Crucially, the Taylor Rule does not identify the level of the funds rate appropriate to the current position of the business cycle. It would be a bizarre coincidence, as Dudley emphasizes, if the funds rate exactly appropriate to today could be described as a linear combination of the unemployment rate (or output gap) and the inflation rate. … No, the key feature of the Taylor Rule is that it incorporates stabilizing feedback signals that allow it to perform well in most economic environments (at least as simulated by econometric studies) despite its failure to identify the appropriate level of the fund rate in real time (which would be impossible). In other words, the key feature of a Taylor Rule is not the level of interest rate it suggests, but rather that it should move in a stabilising fashion. The straightforward interpretation is that policymakers should hike rates in response to the falling unemployment rate. That is, they should ignore whether they have a perfect model, and respond to the data in a presumably stabilising fashion. Gerard disagrees with that interpretation, arguing that policy makers need to keep in mind the proximity to the zero bound. Errors cannot be easily undone. I have not had a chance to think about this too carefully, but my initial reaction is somewhat different. Firstly, I am generally unimpressed to appeals to the zero bound. Secondly, I look at the predictive performance of NAIRU, and I have serious doubts about it's usefulness in the feedback law. I would instead put more weight on inflation, which is not doing anything. Correspondingly, I would also see little reason to tighten rates solely based on the unemployment rate. "From my perspective, this premise is entirely reasonable. If all the data we have for a system includes the effect of a feedback loop (the policy rule), we need to incorporate the possibility of the feedback rule changing in our model estimates." There's a fallacy with that statement though. Policy applies to individual entities, not the aggregate. So there exists the situation where policy changes and it changes not just the policy, but the aggregation function of the individual actors to the aggregate. In other words the feedback loop is chaotic in nature. Sure, but it's complicated. We need to have an idea what the effect of policy is, and somehow take it into account when looking at past history. Easier said than done. I'd suggest it is near impossible to do. The mainstream 'deep parameter' nonsense is like some sort of religious devotion in the hope that God will reveal the truth to them. It's the just the same problem disguised in Wizard of Oz woo. They are looking for Unicorns. The behaviour on policy change is emergent and likely invalidates any empirical data you have from the previous arrangement. Very quickly higher level models end up curve fitting to an a-priori belief like the 'mechanical investing' models that were all the rage in the Tech boom.